Welcome to the last Taylor Takes a Taste of 2011. Welcome to my last post of 2011. This is not a summary of everything that I did in 2011 (that will come January 16th on Taylor Takes a Taste’s second Birthday) but more a post that combines almost everything I am passionate about. In deciding to start a food blog, one makes it pretty obvious to the world that they are passionate about food. So my love for food should be a no brainer. Another one of my passions is photography. Making pictures, learning about new techniques, and experimenting with different lighting setups are all things that happen in my apartment. 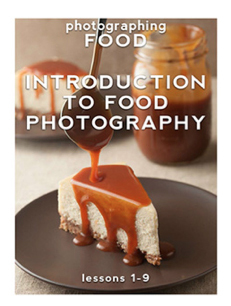 In the past year, I have started to teach about food photography. I have taught a few classes and hosted my own set of workshops. These weekends and afternoons have been some of the most rewarding days of the past year. In 2011, I have discovered my passion for sharing what I have learned with others. For good or bad, we live in a world where your food is first judged by its picture. Whether it be in a book, on a restaurant’s website or any other two dimensional object, your dish will be judged by its picture. If you can’t be there to smell and taste the dish, a picture is all you have to go off of. Because of this fact, anyone who deals with food and the internet has to become a semi professional food photographer. As many of you have realized, that is not an easy task. Yes nice cameras and expensive lenses can produce amazing images in the hands of someone who knows how to use them, but LIGHTING is the MOST IMPORTANT ASPECT of your food photography. This same unfortunate world is a world where one’s food photography schedule doesn’t line up with natural light’s schedule. What does this leave you with? 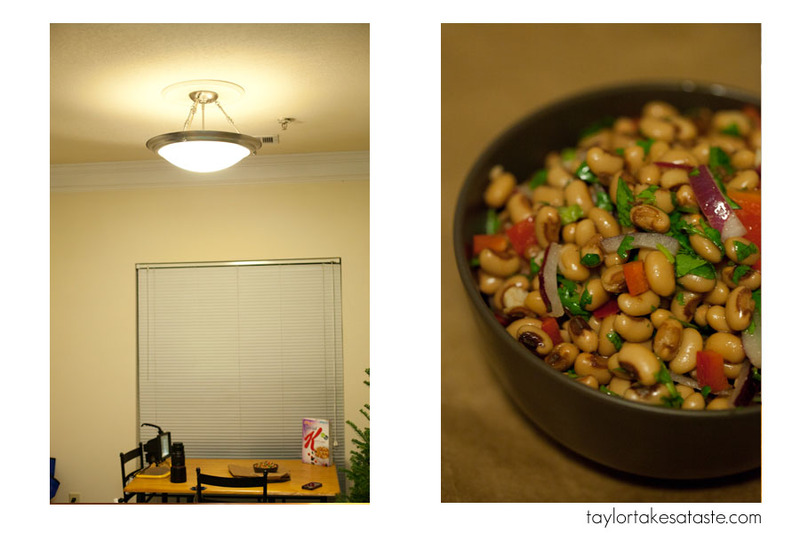 Well you have to try your best and take pictures in your kitchen or other parts of your house using artificial light. 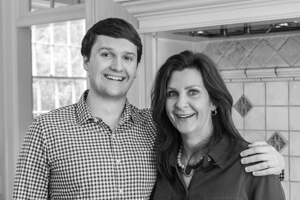 Do pictures in your dining room turn out like this? Or maybe you have found your kitchen works a little bit better? (my kitchen is too messy to take pictures of, Thankfully my girlfriend has an immaculate kitchen complete with pink tea kettle). That is a little better, but still not what it could be. A new year is all about setting new goals. I have a new goal for you. If you have found that your schedule only allows you to take pictures when there is no daylight available, make your goal to MAKE GREAT PICTURES WITH ARTIFICIAL LIGHT! You may be saying, sure you can take great pictures with expensive lighting gear. Yes, this is true, but what if I told you that you could make a photo studio for around $15 ? Yes, it is true. All you need is…. Halogen lights get extremely hot. I mean it. DO NOT use these with animals or small children around. This little $5 light has no on or off switch, so you will need to plug it into a power strip that has a switch. Also, you must use it on a flat level surface. AGAIN, I can’t stress this enough. The light gets very hot so be very careful and let it cool down before moving and use caution. I am not trying to scare you. They are safe, just pay attention when using and do not leave them on when unattended. The second item that you need is a diffusion panel. This consists of a PVC pipe square frame. Take 4 equal lengths of PVC pipe and connect them in a square shape using 4 elbow joints of the same diameter as the pipe. 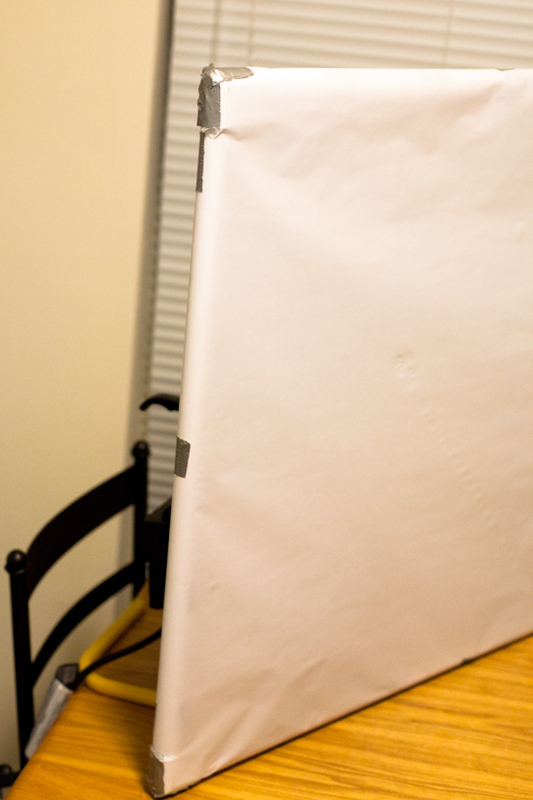 To do this, you will need to tape a diffusion material to the PVC pipe square. I used Paper Vellum. It is sold in large rolls and in sheets. Price will vary depending on where and what size you buy, I bought a 5 yard roll. Cut your vellum to the size of your frame and then tape it to the vellum to the frame. You want to pull the vellum so it is tight and makes a flat panel. You could also use parchment paper. Really, any translucent material that you can make a flat panel out of will work. Different materials will have different effects on the light so play around and see what works best for you. All you have to do is shine your light through your diffusion frame and use a piece of foam board as a fill card. You can use a box or anything else you like to prop up the panel and your foam board. This set up works with backlighting, as well! 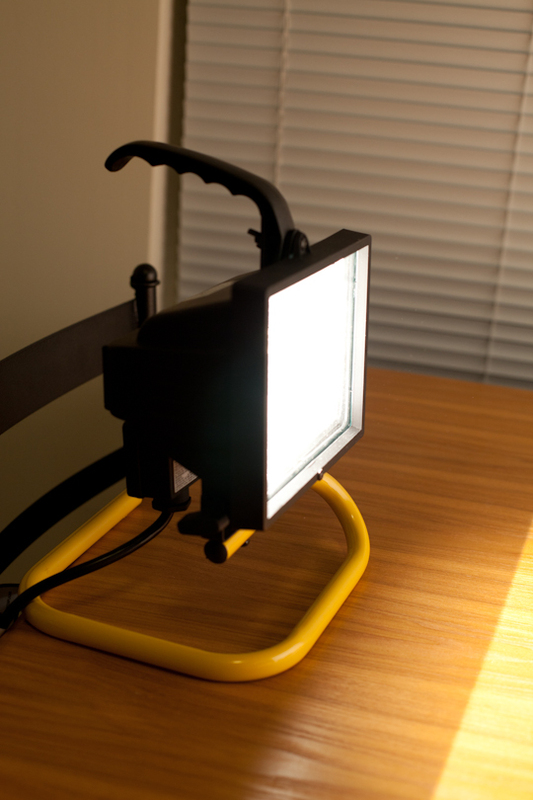 A Halogen worklight is a Tungsten light source, so you will need to change your camera white balance to Tungsten. While this light and set up does have some drawbacks ( I won’t get into those here) and is by no means perfect, for those of you who want to have a great lighting set up for around $15 it is hard to beat! 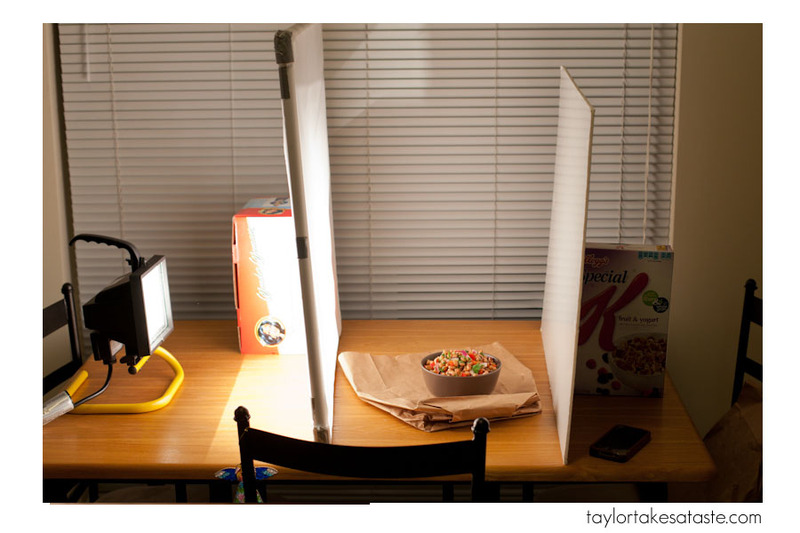 If one of your goals for 2012 is to improve your food photography, I hope that this set up can help! On a related your note, if you really want to improve or learn from the beginning about food photography, I want to help! I have received a lot of emails and questions from people about the December workshops that I did in Charlotte, asking if I would do a workshop closer to where they live. Well, the answer is YES! 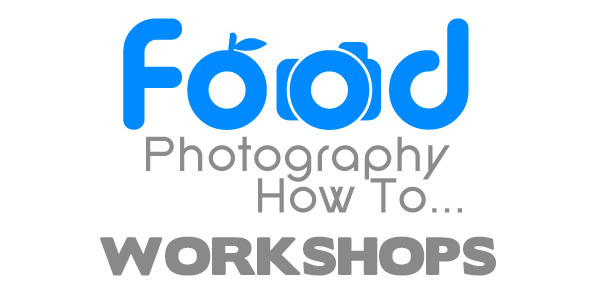 I would love to meet you and spend a day exploring the world of food photography. I am working on the site now, I will let you know when it is ready, but here is the general concept. 3) what are you interested in learning (for example artificial lighting, taking pictures of food outside, flash photography and food, travel.. ) Or a little bit of everything! In a week or two, I will have a page where you can see what cities I have had requests from (right now I am working on NYC area, Boston, and Raleigh, NC) If I can get enough people interested, then I will book a plane ticket or load up my car and come to your city for a weekend filled of food photography and fun! Ideally there would be a Saturday and Sunday workshop that would last the whole day and each day would have at most 8 people. The workshops would take place anytime in April, May, June and July! This is in its preliminary stages, but if you are interested send me a message and lets see what we can organize! Here is to a great 2012 ! For those of you interested in the food, let us talk about Texas Caviar. No, there are no fish eggs here. 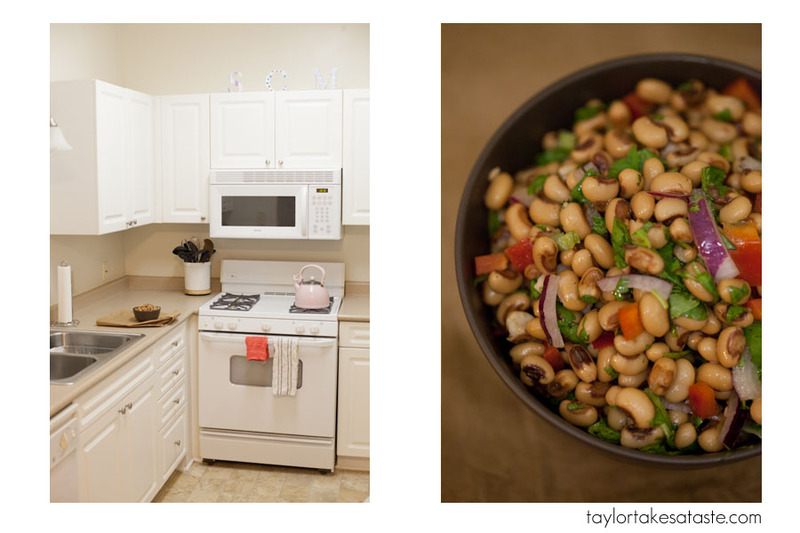 Texas Caviar is a dish made of black-eyed peas! 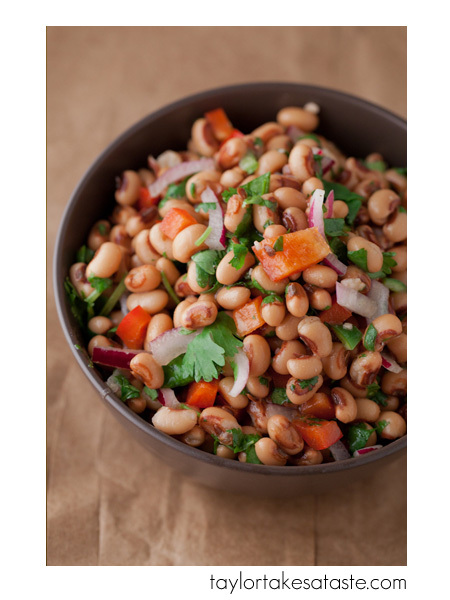 In a large bowl, combine the black-eyed peas, cilantro, jalapeno, red bell pepper, and onion. In a separate bowl, whisk together the olive oil, vinegar, pepper, lemon juice and salt. Pour mixture into larger bowl and toss to cover evenly. Store in the refrigerator until serving. 2011 it was great. 2012 it will be even better! I LOVE this!! And congrats on the photo classes 🙂 Spreading the word! 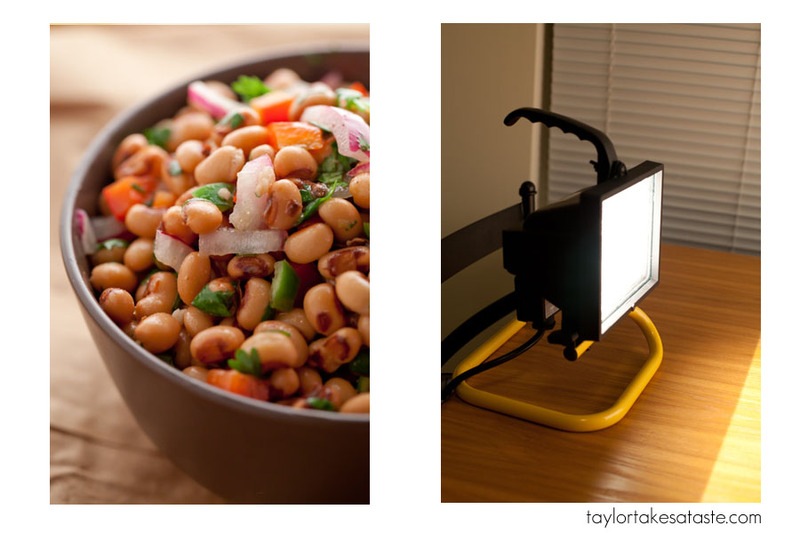 This is so helpful I have a lot of light in my kitchen, but there are days…..and I don’t have any sort of artificial light set-up (and haven’t mastered the flash which is probably just as well.) What are you setting that light on (yellow thingy)? Thanks, Taylor and happy new year. Fantastic tutorial, Taylor! I’m excited about this inexpensive lighting technique. Your photos look great! Awesome affordable suggestions! Bookmarking this page! This is excellent and very helpful!!! LOVE IT!! Wow! Thank you so much for taking the time to explain in detail how you have acheived great food pics. I am new to blogging and you are so right, the pictures of the food HAVE to look good or else no one will want to read further. I cant wait to go purchase and assemble these items and start experimenting! Awesome post, Taylor! Thanks for sharing those amazing and cheap tips on getting the light “on” after dark. Loved the $15 studio idea!! Fabulous, wish you a very happy new year!!! 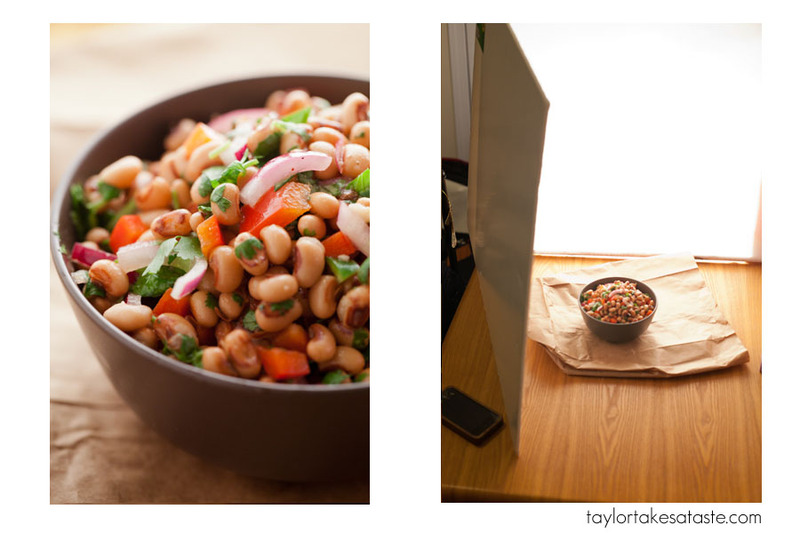 Thanks for the great tip on lighting for food photography! Love your site! thanks for this post! why am I SO STINGY with purchasing equipment for lighting?!?!? obviously this is not a question you can answer…but had you ever felt this way? (in your distant past) or have you always wanted to drop cash for good lighting equipment?! t’s like i put off buying ANY equipment until i’ve saved up for the bet stuff and then that money gets divvy-ed out toward other items in my budget since photography is only a hobby. one day. one day. one day when im old and wrinkly, i wonder, if i’ll ever get to do this photography thing as a profession…..any advice here? thanks for the lighting idea…i might have to go pick up one of these super-dangerous lights 😉 (seriously, thank you for the cautioning) at the hardware store. what is your PREFERRED time of day for shooting food photography? Great site, great food, great photos, great tutorials, and great ideas! You have a great site, awesome photo tips. I still have so much to learn about photography, and your site is a great help. Thanks and happy new year! Thanks so much for this post – it’s very clear, very helpful, and cheap! Awesome 🙂 I feel like I could set this up myself at home. thanks for the awesome tutorial. quick question – what are the dimensions of your diffusion panel? what length pvc pipe did you purchase? Hallelujah! An affordable solution, and one that’s not confined to a box! You’re the best! How I would love to do one of your workshops, although I’m afraid that there probably isn’t enough interested folks here in Great Falls, Montana…would 3 maybe 4 people be enough to drag you to the Northern Tundra? Wonderful tutorial! And I love how the brown paper bag looks for a backdrop! Thanks for the quick tips! I will definitely have to try these out to improve my photography and would love to attend a workshop. I’m still using a digital camera and need to upgrade! Do you have any camera suggestions for a beginner? It’s supposed to pour down rain here all weekend, so I just bought myself one of these lights and am going to give it try tomorrow! Very excited to see how it works out. I would love to attend one of your workshops. I live in Jacksonville, Fl but would travel up to Atlanta or Charleston if did workshops in either of those locations. I can not tell you how much this is going to help me! I photograph with a point and shoot (don’t tell anyone) so any tips on improving the things I can change are wonderful, I’ll be heading to Lowe’s tomorrow! Nice lighting tip. It will be easy on travel. Thank you so much for this setup explanation! I will definitely have to give it a shot. for the cost I have nothing to lose. Please put me on your list for the next time you have a class. Thanks for the great tutorial on the lightning setup to improve the food photos.